This interesting and elaborate dessert works really well for a dinner party. Whisk together the egg yolks and sugar until light and frothy mixture, then sieve in flour. Pour the milk into a saucepan and add the vanilla extract, bring to the boil. Once boiled, pour the boiling milk over the egg mixture. Return to the heat and boil continuously, whisking for approximately 3–5 minutes until thickened. When the custard has cooled down fold in the whipped cream. In the meantime, preheat the oven to 190°C/375°F/Gas Mark 5. Lightly dust your work surface with some sifted icing sugar. Once the block of puff pastry has defrosted cut it in two and roll each half into an even sized rectangle. Cut the pastry into 4 strips (30cm x 6cm approximately). Prick the pastry strips lightly all over with a fork and transfer it to a flat baking sheet. Bake in the oven for approximately 10–15 minutes until the pastry is nice and crisp. When the pastry comes out of the oven dust, generously, with icing sugar and using a chef’s blow torch or the grill from the oven caramelise the top of the pastry. Lay a piece of the caramelised pastry on the work surface and pipe with some of the custard filling on top. 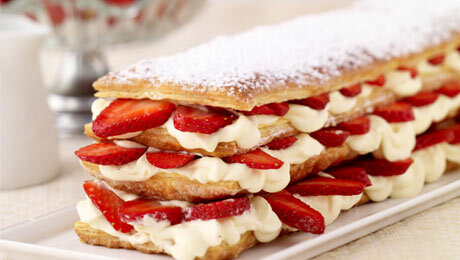 Arrange some sliced strawberries and then another piece of pastry on top. Hi Jackie. We advise using Plain Flour. Let us know how you got on! Is it plain or self raising flour or does it matter?